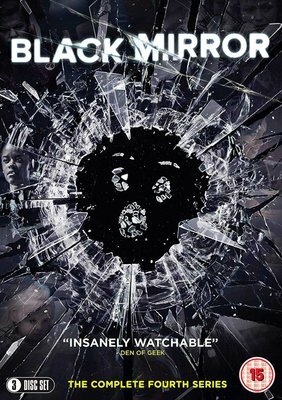 All six episodes from the fourth season of the sci-fi anthology drama created by Charlie Brooker which explores the role of technology in modern society. A woman wakes up on a Star Trek-esque space ship where the crew praise their all-knowing and fearless captain, who has used DNA scans to simulate real people within his game. Starring: Jesse Plemons, Cristin Milioti, Jimmi Simpson, Michaela Coel, and Billy Magnussen. After nearly losing her daughter, a mother invests in a new technology that allows her to keep track of her child. Starring: Rosemarie DeWitt, Brenna Harding, and Owen Teague. A woman's past comes back to haunt her while an insurance adjuster questions people about an accident with a memory machine. Starring: Andrea Riseborough, Kiran Sonia Sawar, Andrew Gower, Anthony Welsh, and Claire Rushbrook. A new dating app allows the matched couples to be told how long their relationships will last. Starring: Georgina Campbell and Joe Cole. A woman attempts to survive in a dangerous land full of robotic guard-dogs. Starring: Maxine Peake. A woman enters a museum where the proprietor tells her stories relating to the artifacts. Starring: Douglas Hodge and Letitia Wright.